Instead of doing a whole long blog post to recap my year (which I usually do mostly for the sake of my own obsessive record keeping and reflection), I’m going to tell you how deeply and terribly depressed I was one year ago today, and how I made it from that moment to this one, from that December 31st to this December 31st, because there is a kind a reassurance for me in retracing these steps. People have so many metaphors for perseverance: one day at a time, one foot in front of the other, the only way out is through. And as much as I love a metaphor, not one of these words stacked in front of the next has ever pulled me from any kind of darkness, so this year I had to learn how to find my own way. I woke up January 1st on my very favorite piece of planet earth. 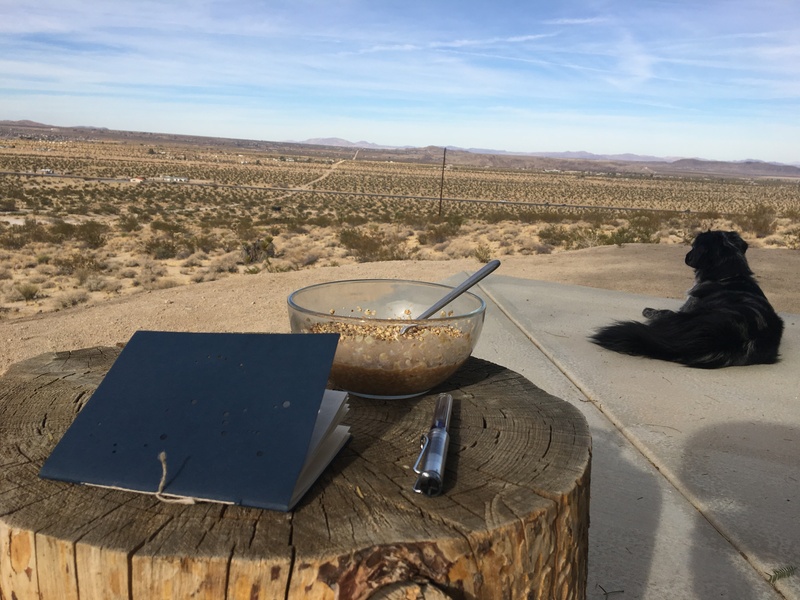 I sat in my favorite chair overlooking my favorite view with my dog and a bowl of oatmeal and I tried to write a version of 2018 as I wanted it to be. I was deeply miserable in that way where you don’t even totally feel pain anymore, but you don’t feel numb either. It was something inarticulable. I didn’t see a way out of the depression I’d been swimming in for months. But I wrote anyway. The word gentle came up a lot. Supportive. Loving. Everything I wrote revolved around a sort of slow kindness, but it’s hard to make yourself just feel a thing because you want to. So I made a plan. I bought a Passion Planner, which cost about $20 and helped me articulate all kinds of goals, not just about what I wanted to accomplish but about how I wanted to feel. This helped me visualized what I needed to do with my time and how to arrange different parts of my life in relationship to each other. I started meditating ten minutes every morning. 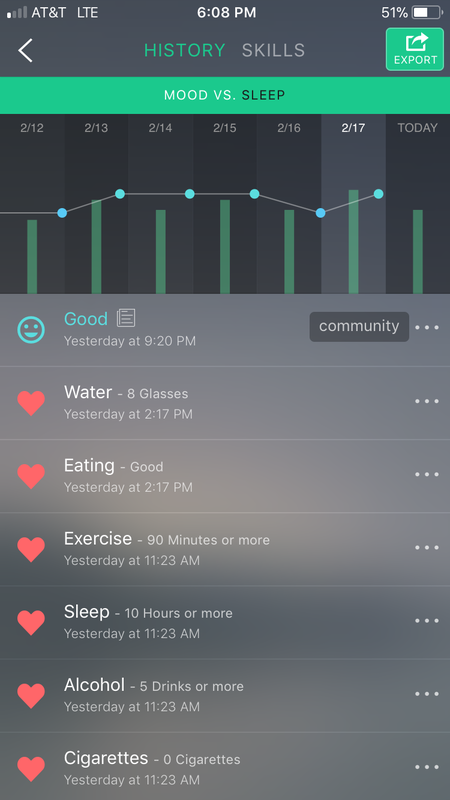 At the beginning of the year, USC had a deal with the app Calm that gave students, faculty, and staff with USC health insurance a free year subscription (this subscription didn’t last a year, though, but I was able to still use some of the free meditations). I found a therapist (who took my insurance) and she has turned out to be the only good therapist I’ve ever had (I’ve had four others before her). I started seeing her weekly, and thanks to my insurance, it only cost $9 per session. My weeks started to take a more consistent and steady shape. My neighbor and I would walk our dogs between 8 and 9am every morning. Then I’d meditate for ten minutes. I’d make sure to eat regular meals, exercise at least three days a week, see my therapist on Fridays, take weekends off work (when possible). My moods started to level out. The highs and lows got less high and less low. I found some semblance of stability. It was quiet there. I got bored but I didn’t mind because I wanted to keep living, and that alone felt like enough. I started re-introduce small moments of joy. Comedy shows, dinner with a friend, a trip to go get ice cream. I showed up for my students. Taught. Graded. I went to the desert sometimes to feel the ground. I tried to be there for my friends as much as I knew how. I had to let a few relationships end and I had to trust that I knew what was best for me. I stayed open to the possibility of love, even though I wasn’t sure what that truly looked like. By the time summer came, I was ready to feel things and do things and work on what inspired me. I put together a poetry reading. I wrote 15k+ words of my novel. I prepared to turn 30, then did it with only minimal days of panic leading up to the moment. On the other side of 30, I felt free. The second half of the year has felt like living off the seeds I planted in the beginning. 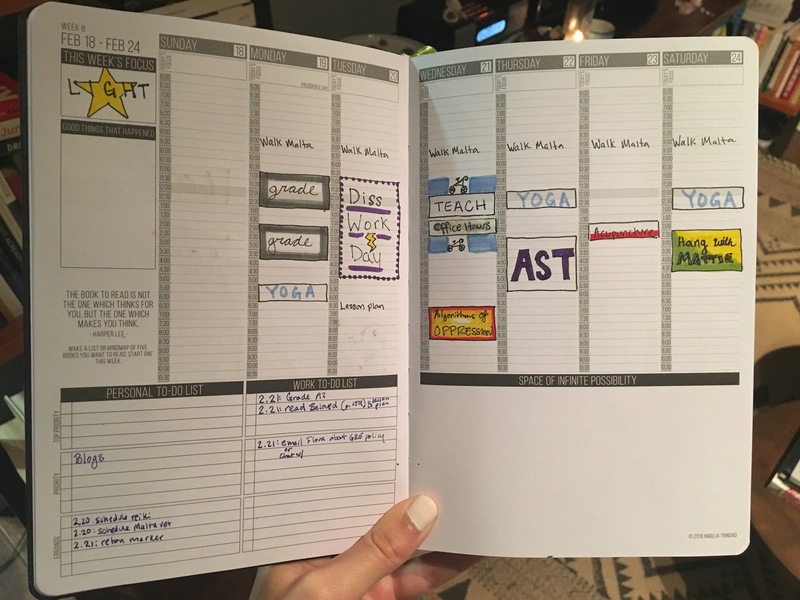 I stopped needing my passion planner to schedule my days. Healthy things became routine. Most importantly, I read this book my best friend gave me for my birthday. It outlined, broadly, the psychological model that is attachment theory. Everything shifted. I began to see how the ways I had attached to others in the past were premised on a kind of behavior that made it hard for me to find good, kind, loving partners. Reading this book felt like seeing the matrix for what it was. I made my friends read it. I made my students read it. I would make every sixteen year old in the country read it if I could. It should be a part of health class. It should be mandatory to learn how to treat other people with respect, to show other people support, to understand why it is necessary to have the best intentions for the people you claim to love. This book opened a door, and not long after I walked through it, I found something so much better than what I’d ever thought possible. The final few months of my year were spent revising and re-revising and re-re-revising my job market materials. Same with my dissertation (which I will finish in 16 days, submit, revise one more time, then defend on March 1st). This isn’t a victory lap, it’s a recounting of the steps that it took me to get here. It’s a reminder, mostly to myself, of just how much energy and commitment it takes me to stay healthy, that it’s a continual process and not a reachable goal. I had an anxiety attack a little over a week ago. My first bad one in a year. I was disappointed in myself. But that can’t be how this works. So this is a reminder for that, mostly, and a list of events strung into a narrative that will help me find my way when I need to again. This post sounds like a bummer, though this year was anything but. This year I learned how to live inside myself, and that prepared me for all of the beautiful surprises that led me to this moment of deep gratitude and true excitement for 2019. This was the best year I can remember having, not because anything huge happened. 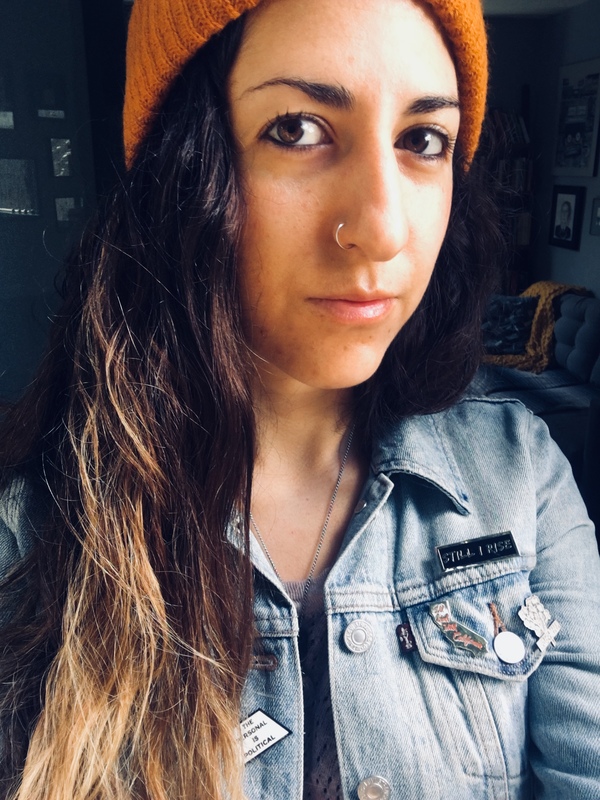 I didn’t get a job, I didn’t write or publish as much as I would have liked, I made a lot of mistakes, I wasn’t always (or even often) happy, but I recommitted and connected to the people who matter most to me, to the places that matter most to me, and if last year I was guided by the word “ground,” next year I will be guided by the word “light.” Light as in grace, light as in illumination, light as in joy, light as in ease, light as in warmth, light as in allowing myself to be pulled by something I might not quite understand yet, with knowledge. And hope. Lovely. Thank you so much for walking through life with intention and sharing the value of that action with others. Ali is angel in my lexicon. Love you always, Barbara (currently in Baltimore w/ Raphael).